Today's image (approx. 5,7 Km - such as about 3,539 miles - across) features the Outer Edge and Slopes of a relatively small (~10 Km - such as about 6,21 miles - in diameter) Unnamed Impact Crater located to the North/West of Copland Crater. The bowl shape of this Simple Impact Crater (meaning without Inner Terracing and/or Central Uplift and/or a common Wall with another Crater) results in a particularly dramatic shadow at High Solar Incidence Angles. 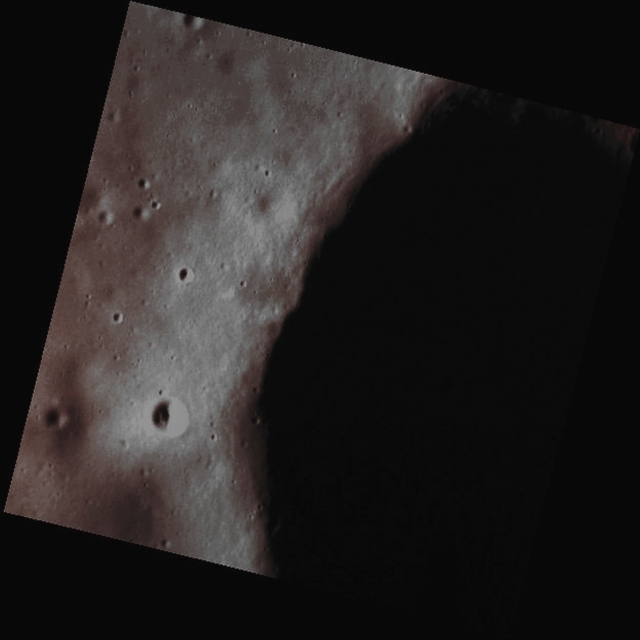 This picture (which is an Original NASA - MESSENGER Spacecraft's b/w and Map-Projected image-mosaic published on the NASA - Planetary Photojournal with the ID n. PIA 18737) has been additionally processed, contrast enhanced, Gamma corrected, magnified to aid the visibility of the details and then colorized in Absolute Natural Colors (such as the colors that a human eye would actually perceive if someone were onboard the NASA - MESSENGER Spacecraft and then looked outside, towards the Surface of Mercury), by using an original technique created - and, in time, dramatically improved - by the Lunar Explorer Italia Team. Different colors, as well as different shades of the same color, mean, among other things, the existence of different Elements (Minerals) present on the Surface of Mercury, each having a different Albedo (---> Reflectivity) and Chemical Composition.